Fotoquelle: visitbratislava.com und slovakia.travel.sk Most SNP is one of the most significant landmarks of Bratislava. 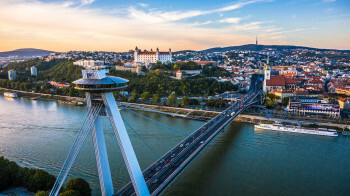 With a length of about 470 yards, the Bridge of the Slovak National Uprising (Most SNP) surmounts the river Danube, connecting Petržalka to the Old Town of Bratislava. Since its opening in 1972, the bridge has become one of the most significant landmarks of the Slovak capital. Most SNP boasts a unique architecture. The asymmetric, double-decked cable stayed bridge was built according to plans by Arpád Tesár, and is still the largest bridge across the Danube. Furthermore, it is the only one of its kind held up merely by one single pylon. At almost 280 feet, said pylar is home to several special attractions. Inside of a flying saucer shaped construction, you can find a viewing tower as well as a restaurant. With the catch phrase "watch. taste. groove", visitors are invited to enjoy the unique view over Bratislava. 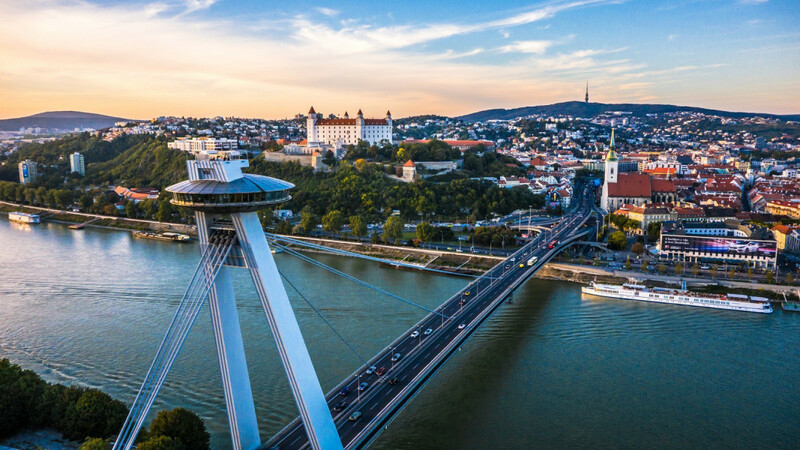 From up here you can see the Danube with its bridges as well as other landmarks, such as Bratislava Castle, the Slovak parliament, or St. Martin's Cathedral. At the UFO restaurant, you get delicious culinary treats served along with the view. The dishes are influenced by international cuisine, especially the Mediterranean and the Asian. Along with its two bars, it makes sure you will leave this place neither hungry nor thirsty. If you're looking for more excitement, you can venture out onto the Skywalk. A professional guide helps you out of the window as you walk along the window sills to enjoy a whole new perspective. Don't fancy taking the stairs or the elevator? The really brave can try the abseiling experience, and take in the view while you slide down on a rope. Planning for the bridge began in the early 1960s, when the Old Bridge was supposed to be replaced. In the years before construction started, opposition arose especially with artists and intellectuals. They critisised the destruction of parts of the Old Town that was needed to make room for conveyors and the bridge itself. In the course of the Normalization of Czechoslovakia after the Prague Spring, the discussion died down. Construction started in 1967, and the bridge was opened on 26th August 1972. The first restaurant opened on top of the pylon in 1974. In 2005, it was reopened under the name of Ufo. The SNP Bridge is located in Bratislava's city centre, where it connects the Old Town to Petržalka. It starts north in between Bratislava Castle and St. Martin's Cathedral, and goes towards Sad Janka Kráľa park in the south.